Medium and high-power optical Fiber Lasers operating in the 1um region have proven their capabilities in the cutting and welding of a wide range of metals in industrial materials-processing applications. In this application insight we consider the use of medium power (400W) Fiber Lasers in precision fusion welding. We present their performance and process capabilities, consider key requirements of the welding process, and illustrate their use in welding applications. Fiber Lasers have been extensively deployed in advanced manufacturing applications such as precision cutting, micromachining, rapid prototyping and welding; their performance advantages in terms of beam quality, depth of field, parametric dynamic range, wall-plug efficiency, process versatility, reliability and cost have been well recognised. In welding applications, medium-power Fiber Lasers offer industrial process technologists and users new degrees of operational freedom and process control whilst concurrently delivering major benefits in terms of ongoing operational costs due to Laser maintenance support, day-to-day process “tuning”, and consumables consumption. These latter features can be of crucial importance to high-volume continuous manufacturing processes where 24/7 operations at high productivity and “right-first-time, every-time” are crucial to both cost and capacity. 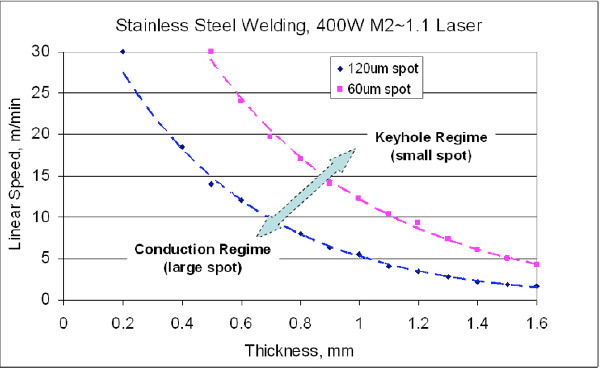 There are many choices of beam source for Laser welding using a 1um source: Historically “welding Lasers” would be “long-pulse” devices capable of delivering significant pulse energy (Joules) with kW-class peak-power in pulse durations of the order of milliseconds (ms). The maximum duty cycle for this class of pulsed source would be typically 10% (at full power), and the pulse repetition rate would be typically up to 1kHz; the limited pulse-repetition rate of this type of beam source could frequently be the process-limiting factor. With this class of Laser, the welding process is generally “conduction” based, whereby energy is delivered into the material in a series of pulses and is absorbed on the surface of the material; sub-surface melting occurs and the energy thermally diffuses through the weld zone by conduction and convection in the melt. Process speed and penetration are determined by the Laser parameters, in particular pulse frequency, pulse energy and average power. Conduction welds are consequently semicircular in cross section with aspect ratios of 1:2 or less. Due to the (slow) thermal diffusion process for creating the melt, the heat-affected zone (HAZ) around the weld can be substantial. High-brilliance CW Lasers such as the Fiber Laser and the disc Laser provide an alternative process for fusion welding: Provided that the focused intensity of the beam at the metal surface exceeds a threshold, the incident energy raises the metal temperature above its boiling point, produces a metal vapour channel (“keyhole”) which absorbs the incident Laser power and converts it into heat. Energy is absorbed as it progresses down through the channel, producing a deep and narrow weld for which the aspect ratio (depth/width) of keyhole Laser welds can be as high as 10:1. Because the Lasers can operate in continuous wave mode, once established, the keyhole can be sustained to produce uniform (narrow) welds with a much-reduced HAZ. Importantly, CW Modulated (CWM) Fiber Lasers provide the process designer with the choice of welding mode between “pulsed mode” or “CW mode” welding. As noted above, CW provides sustained energy input and hence “speed”, whilst pulsing provides the option to reduce process speed in situations where “precision and control” are of primary importance. By appropriate arrangement of the beam delivery optics, the size and power density of the incident spot can be controlled according to processing needs. The range of welding applications and materials addressed using medium-power Fiber Laser sources continues to expand from the fine-welding applications used in manufacturing of medical devices to more mainstream industrial applications. The smooth finish and visual quality of CW-welded seams can be important for both cosmetic effect and/or ease of sterilization (in medical applications). Where overall cost becomes critical, modifications of the beam spot size as discussed above to relax the tolerances for finish quality and fit-up tolerances of the welded parts become increasingly important. In designing the weld process, appropriate selection of key parameters such as spot size, power level, weld speed and shield gas choice/flow conditions are made to provide a suitable weld profile (depth, width (or diameter for spot welds) with process margin to accommodate fit-up tolerances, material variations, and metal vapor plume effects. 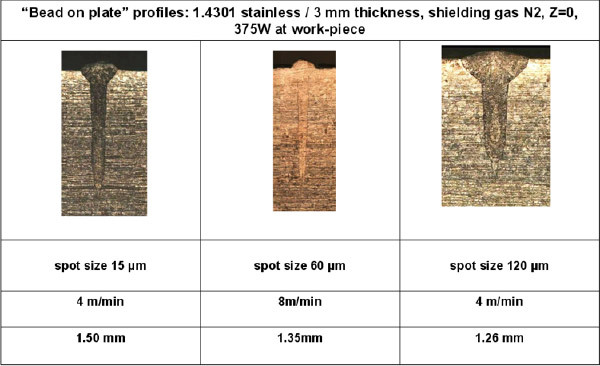 Figure 2 below shows the effect of using two different focused spot sizes (2:1 ratio) on weld penetration depth and speed in the welding of stainless steel. Increased spot size provides a larger fusion zone and increased process tolerance with a corresponding trade-off on process speed. 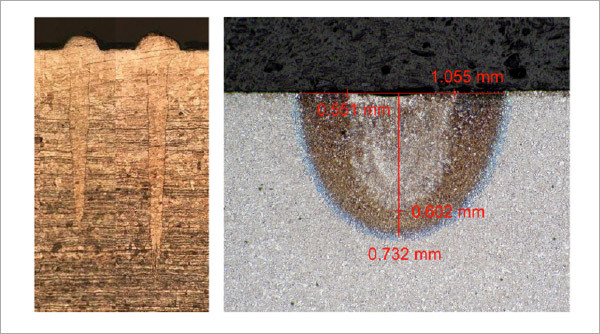 Note that for the two key-hole welding examples above, the penetration depth was comparable and the process speed is increased (~2x); this suggests that in the 15µm case, the process-limiting factor is energy coupling into the material through the vapor plume created at the surface. Further increasing the spot size to 120µm changes the fusion-zone profile to a “hybrid profile” comprising an upper conduction zone and a broader, less deep key-hole zone; increasing the volume of the weld in this way requires a corresponding reduction of process speed. Figure 3 shows the weld process capability for the 60µm and 120µm spot-size cases for linear seam welds undertaken with “weld bead-on plate” trials. Single-moded medium-power optical Fiber Lasers are well-suited to precision welding of metals across a diverse range of applications.